Rev. Thomas E. Hartshorn, D. Min. Our minister, the Rev. Thomas E. Hartshorn, D. 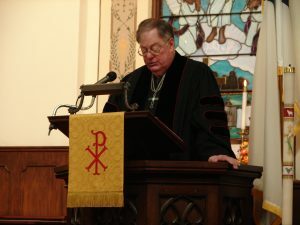 Min., has been the pastor of Christ Reformed UCC since 1991. He is a true native West Virginian, having graduated from high school in Charleston, W.V., and earning a bachelor’s degree at Morris-Harvey College, also in Charleston. He attended the West Virginia University School of Medicine for two years. After deep thought, he recognized his calling for a commitment to Christ and earned a Master of Divinity degree from the Wesley Theological Seminary located in Washington, D.C. Next, he attended the Pittsburgh Theological Seminary in Pittsburgh, Pa., where he earned his Doctor of Ministry degree. Tom began his ministry in the United Methodist church, where he was a minister for 13 years. He served his last UMC congregation in Chester, W.V., then transferred to the United Church of Christ. With the UCC, he has served congregations in Billings, Mont., Douglas, Wyo., and Alexandria, Minn., before returning to West Virginia and joining our church here in Martinsburg. Tom’s wife, Mary, is a registered dietitian and certified diabetes educator. The Hartshorns raised three children, Holly, Joel and Mark, who have blessed them with four grandchildren. Our pastor has a deep love of family which he openly shares with the members of the church. Our church family cherishes those visits when some of the Hartshorn children come to Sunday morning service and bless the congregation with their gifts of music. Rev. Hartshorn’s sermons uplift the congregation and leave us with something to think about during the week ahead. We can never be sure what form the sermon will take: it could be given from behind the pulpit, on a stool closer to the congregation or behind the piano. But one thing is certain: no one wants to miss what’s coming up next!